The Cash Projection Report graph application facilitates Elliott reporting features by plotting the anticipated future revenue outlook of your organization. 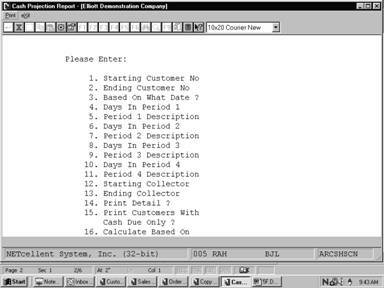 It processes information obtained from the A/R Open Item File, and creates a report that projects the amount each customer account will contribute to the overall projection within a given period of time. This resource can provide a powerful visual representation of important business variables such as the comparative amount of anticipated future gross receipts generated by your most valued customers. It can also be used as a tool to set organizational goals, and plan future resources. You may also choose to calculate the Projected Revenue based on the invoices' due dates or the customers average number of days to pay during the current year. If one or more of your customers have a tendency to pay early or late, basing the report on average days to pay can provide a more realistic picture of when to expect cash receipts. Enter the starting customer number, in the range that you want to plot. If you press RETURN for the entry of the starting customer, the field will default to Allcustomers, and the ending customer will be skipped. Enter the ending customer number in the range you want to plot. 3. Based On What Date ? 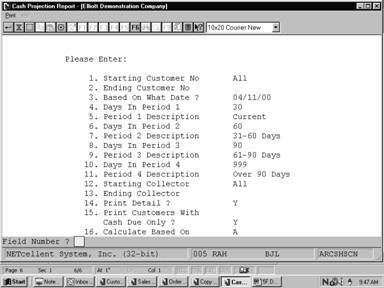 Enter the future date that you want to forecast projected cash receipts. This field automatically defaults to the present date. This field automatically defaults to the predefined settings in you’re a/R Setup. For the purpose of this graph you can enter a different number of days to be considered in Period 1. You may substitute this with the description entered here. This information will appear when the resulting graph is printed. This field automatically defaults to the predefined settings in your A/R Setup. For the purpose of this graph you can enter a different number of days to be considered in Period 2. For the purpose of this graph you can enter a different number of days to be considered in Period 3. For the purpose of this graph you can enter a different number of days to be considered in Period 4. Enter the starting collector number, in the range that you want to plot. If you press RETURN for the entry of the starting collector, the field will default to Allcollectors and the ending collector will be skipped. Enter Y to see all customer detail, otherwise a summary will print. 15. Print Customers With Cash Due Only ? Enter Y to see only the customers that have open invoices that are expected to be paid. 16. Calculate Based on ? Enter A to calculate projected revenue based on each customer's average days to pay during the current year. If customers tend to pay their bills early or late, this option can provide a more realistic idea of when to expect cash receipts. Enter B to calculate projected revenue based on the due date for each document in the Open Item file. This field defaults to A. Can I Reapply a Payment to a Different Customer in AR? AR Aging Report - What's the Difference Between Py and Px Payment Type ? How to Subscribe a Customer Event by Salesman? What Does the Asterisk Mean in A/R Account Inquiry? How Do I Start to Collect Sales Tax for Other States? How Does Elliott Determine Sales Tax Codes? Why Are Customer Last Aging Date and Amounts Not Updated?